Brilliant Classics continue their journey through the back catalogues. Here they tap into the EMI Classics shelves. They have done well although the three discs have a lop-sided incomplete feel with only four of the Dvoř�k Nine. Looking back at the now almost forgotten old numbering they represent numbers 1, 3, 4, and 5. Had Jansons recorded number 6 the coupling balance would have been better. However he departed for pastures fresh before EMI could add the Sixth. Having carved out for himself a reputation as a top rank Tchaikovskian with his Chandos set of the six numbered symphonies and Manfred - still a premium item after all these years - Jansons then had moved company to EMI Classics. 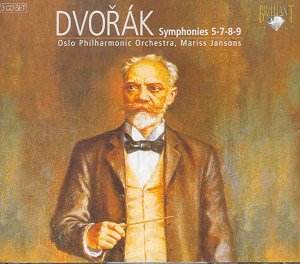 These Dvoř�k symphonies represent one of their earliest forays and they are pretty much of a success. Jansons chases selected details of the first movement of number 5 with a fiery urgency. Small gestures which always had an excitement are given a keen impetuous edge. Yet there is also warmth there. The sound is quite gripping - though curiously lacking body and immediacy at times in the string tone. Othello is superbly done including a lightning sharpness in the little instrumental flurries at the start. Is it my imagination or does Jansons bring out parallels with Tchaikovsky�s Fifth and Hamlet at circa 3.00? The romance of the score sings in ingenuous candour at 5:34 onwards and in the final gestures Jansons again whips an edge of anger into the darker material. The Scherzo Capriccioso is a showcase for the warmth of the recording in the baritonal range but as a reading it shows a tendency to slacken off the tension although the grateful folk dance at 6:10 is a delight as Jansons reasserts his grip. Coupling symphonies 7 and 8 has been a popular move since the earliest days of the compact disc. And these are radiant readings with Jansons making much of the canorial lilt of the third movement of No. 7 and its mildly tragic occlusion of mood. He brings to the Eighth much excitement and snap and even in the pastoral pipings keeps momentum going. His lilting way with the Seventh carries over into the Allegretto grazioso of No. 8. The brass distinguish themselves with their rollicking rolling roar in the finale. Finally the Ninth. Interesting that as with Othello Jansons brings out parallels with Tchaikovsky�s Fifth. Split-second simultaneity of attack and an easeful way with the many lyrical and reflective moments in this work make this a memorable version. One gripe: I regret Brilliant�s decision to present these three discs in a double width casing. Wallet format would have been preferable. There are many versions of the Dvoř�k symphonies from which to choose. If the coupling appeals this box will serve the listener well and deliver a Dvoř�k that is not merely affable but also lyrically urgent.